Aging is hard on some "classics"
This science fiction is typical of a whole period, the very period after 1968. It was the time when the hippies died at the end of Hair, when the flower boys and girls departed at the end of Fritz the cat or Alice's Restaurant, when the Vietnam war became very ugly in Zabriskie Point, when the lying president was going to be re-elected for him to be resigned by Congress just one year later and buried by Jimi Hendrix in Woodstock. This film is just the testament of that dying world. And it invented the mad cow disease just thirty years before: use dead human carcasses to feed the living and you will make that humanity degenerate so fast that there will be no crowded cities for long. It is the end of a period and nothing else and there is absolutely not one single ounce of future in that science fiction. But the music is great, especially the classical funeral march. 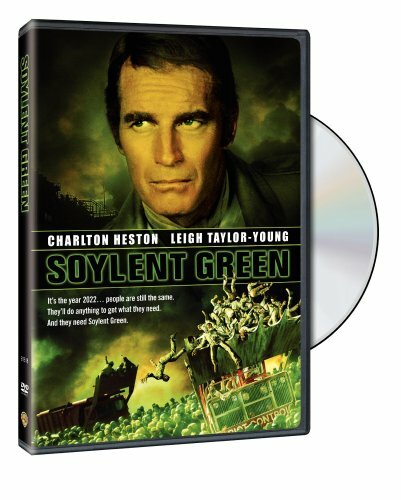 "Soylent Green" was made when the first oil crisis was at its peak (early 1970s). The 'pop' culture was filled with worries over resource shortages, much as the 2000-2009 era has been filled with worries over global warming. There was concern about population growth and food shortages. No one actually expected things to work out as well as they have, so far. However, the main fault of the premises was that the future depicted in "Soylent Green" was set in 2022, but, probably, should have been set another 25 to 50 years further into the future. Some reviewers have complained about the cheesyness of the sets. However, they have not thought the situation through. Were would better furniture (for example) come from? Answer: natural resources. This is not a pretty nor gentle movie. There is drama and depressiveness here. However, it is a very good depiction of a possible future. We may, still, have to cope with a future such as this. In 2050, the prediction considered to be the most likely is of 10 billion people on Earth. That is, about, a 40% increase over the next fifty years and we keep paving over the best farm land. Some folks in the third world were starving last year. So, where, exactly, is all that extra food going to come from? And, once we get to 2050, does the population continue growing? Why? Why not? How fast? What kind of government will we have? How do we avoid the government shown in the movie? Those six questions are why Soylent Green was made. Charlton Heston does a good job in a role that was different from his usual type of role. However, the actor to watch is Edward G. Robinson, in his last acting role. Robinson did a magnificent job. Buy the movie, watch the movie, be prepared to be thoughtful about the movie after watching it! Terrific movie that manages to both be a `message movie' and still be entertaining. I wish modern sci-fi movies would look back to Soylent Green to see that sci-fi doesn't have to be dumb to be entertaining. Overpopulation is rampant. The ecology has been destroyed and the Earth is barely able to sustain the multiple billions of people living. A company called Soylent is responsible for feeding half of the planet, manufacturing food from soy beans and algae from the oceans. A top level executive with Soylent is murdered. All the evidence points to a random burglary gone wrong. Charleton Heston is the harried cop assigned to the case. The further he digs the more his superiors try to pull him off the case. What's going on and how does it relate to Soylent's newest foodstuff: Soylent Green? The concerns that this movie (and the original book Make Room! Make Room!) is based on, namely a book called The Population Bomb, has failed to come to pass, but the movie is still worth watching anyway. The realization of a hot grungy future with heat waves that can last a year or longer and not enough space for the vast numbers of people is brilliantly realized. Everyone except for the super-rich is sweaty and grimy. Dust fills the air. Riots are so out of control, dump trucks have to be called in for crowd control. The cops (including our hero) are all corrupt to varying degrees, yet you can see why they would be. There's just not enough to go around and everyone has to fight for whatever scraps they can get. The lack of computers and internet doesn't date this movie as care is taken to show there is barely enough power to keep the lights running. This is a very serious movie. It is about overpopulation of people, pollution and corruption (very much a part of the Bush adminitration). Don't bother to read the book "No Room, No Room" it is nothing. The movie makes a sense of need,security and wanting of the old days and the "Good Life". It is sad, horrifying and terrible what happens but probably very "true to life" in the very near future. The movie is accurate but outdated because of the old cars used (they should be newer in the year 2020) along with the old videogames and style of the city itself. But the story is very strong and accurate of what the near future will most probably be like. Food shortage takes the cake here. It is sad to see Edward G. Robinson in his last performance here and yes He dies in the movie too. So beware man...keep killing the trees keep killing the animals keep burning that gas and oil but... we will all pay for it soon. One of the most accurate of the Science Fiction movies. A classic! Though plot slow in developing, is worthwhile and cautionary.